One of my favorite vintage pen companies is the Houston Pen Company. Founded in Tracy, Minnesota in around 1908 by William A. Houston, it has an interesting history, much of which still remains uncovered. Mr. Houston was at one time a successful barber in Tracy, who decided to change professions and hit the road as a salesman. 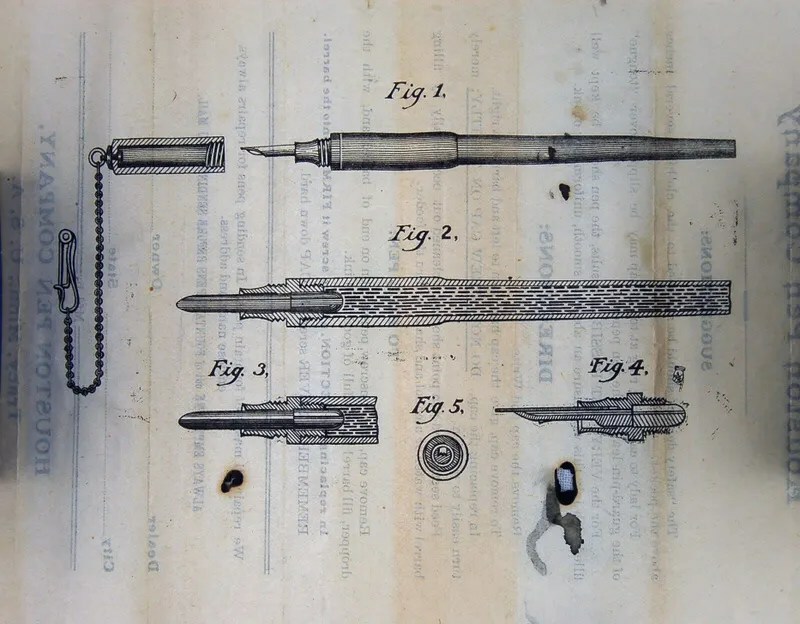 Fountain pens were one of the products that he sold and took an interest in. In 1908 he successfully patented his first pen and began production. In or around 1912, he picked up and moved to Sioux City, IA and formed a relationship with the General Manufacturing Company. Pens were produced under the names Houston and Snapfil during this time. Eventually, Mr. Houston produced a Jiffy brand of pens, and this may have been separate from the General Manufacturing relationship. In 1926, he surfaces in Los Angeles and files a patent for a plunger-fill fountain pen with Dillman Charles Houston. This week’s restoration is a Snapfil Lever Filler, manufactured in Sioux City. Below is the exploded view of this BCHR (Black Chased Hard Rubber) pen. The pressure bar is attached to the inside of the barrel and in good condition and was not removed. Only two sections remain of the old sac in the bottom left of the photo. As the pen is hard rubber, care is taken in cleaning the pen as the old hard rubber does not react well to water. I cleaned the inside of the barrel and cap with a dry brush and dry q-tip. 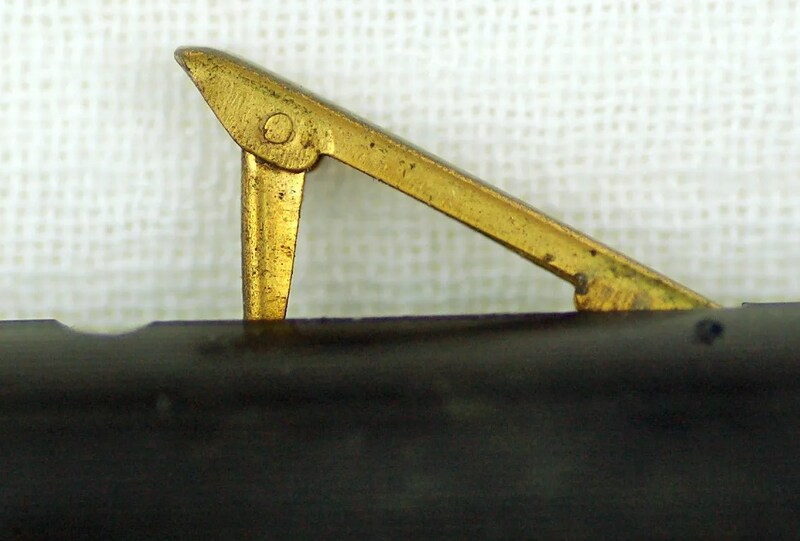 The gold barrel band, chain, clip, and nib were cleaned with gold cleaner and a jewelers cloth. However, the lever is thinly gold plated and I know from restoring a number of these, the gold will wash off easily, so I just gently wiped it clean so that it will retain what little gold color is left. The feed is unique and featured on the imprint of the Houston Pens produced in Sioux City. Below is a close up of the feed of this Snapfil and an imprint of a Houston Pen featured in the April 10, 2008 post referred to above. 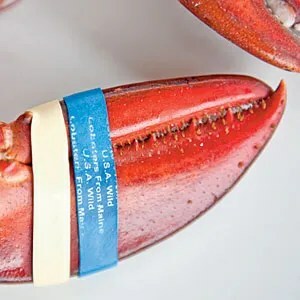 It reminds me of a lobster claw. Below is the feed from the bottom, showing he three channels for the ink to go from the sac to the nib. Always make certain to clean these with a sharp tool such as an x-acto knife. Here is the finished pen. It measures 5 5/8 inches closed and 6 inches posted. The chain and pin were to allow the pen to be pinned to an article of clothing such as a suit vest for easy carrying and access. The pin is very familiar to Houston Collectors and appears on many of their pens, which rarely had clips. 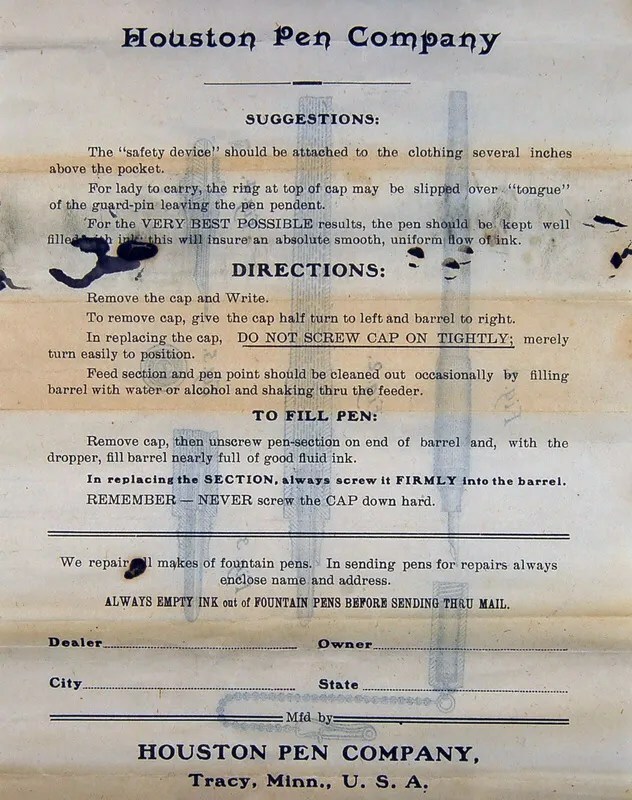 Thus, the cap is a screw fit to the barrel to allow for safe carrying. The Snapfil gets its name from the unique lever system. 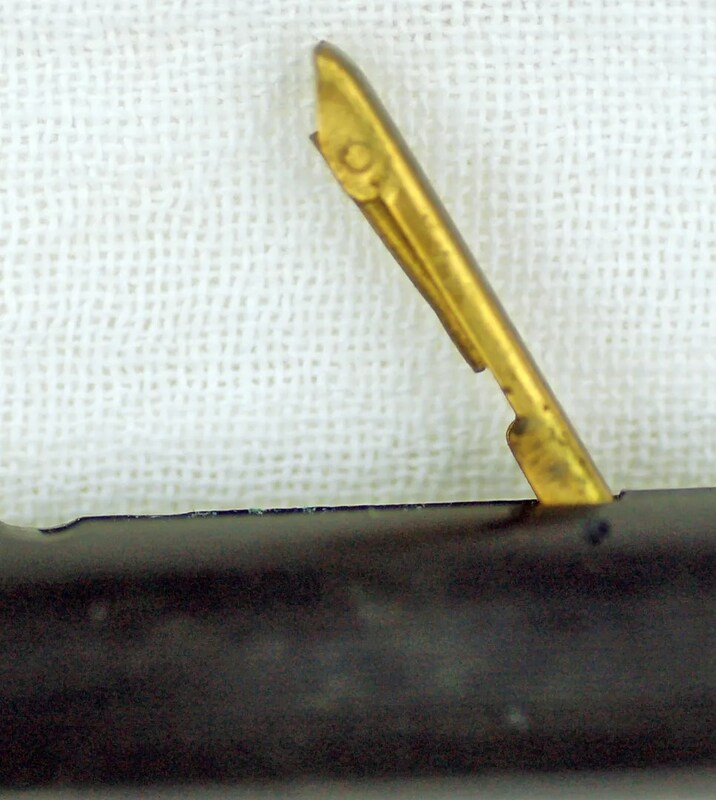 Here you can see the lever raised after pulling up from the barrel. The lever then drops a folded section to depress the internal pressure bar to compress the sac and fill the pen with ink from a bottle. The Number 2 Snapfil 14K nib writes with a medium to broad line. The cap band is wide an contains this “MH” set of initials. Produced prior to 1920, this was a nice pen for the this owner. I am still on the lookout for a Jiffy Pen from Sioux City and any of Houston’s Californian Pens. Hopefully, future posts will reflect finding some of these…. Occasionally you hear collectors of various items, including fountain pens, speak of “holy grails”. These are items that they seek and are at the top of their lists of desired items. For several years I have collected Houston Pens and their offspring (Jiffy and Snapfil). I have covered a Houston Pen, made in Sioux City, IA in my post of April 10 – Houston Pen Company. I finally had a chance to acquire a Houston Pen made here in my home State – Minnesota. The Houston Pen Company was started in Tracy, Minnesota in 1908 by W. A. Houston and moved to Iowa near 1912. So the Houston Pens made in Iowa are much more plentiful. I have posted a few photos of the materials that arrived with the pen; an outer box which shows the manufacturing location of Tracy and the direction sheet and drawings of the pen. This is obviously an eyedropper, so there were few repairs to be done. I did polish the gold parts, remove the feed and nib, and thoroughly clean the section. 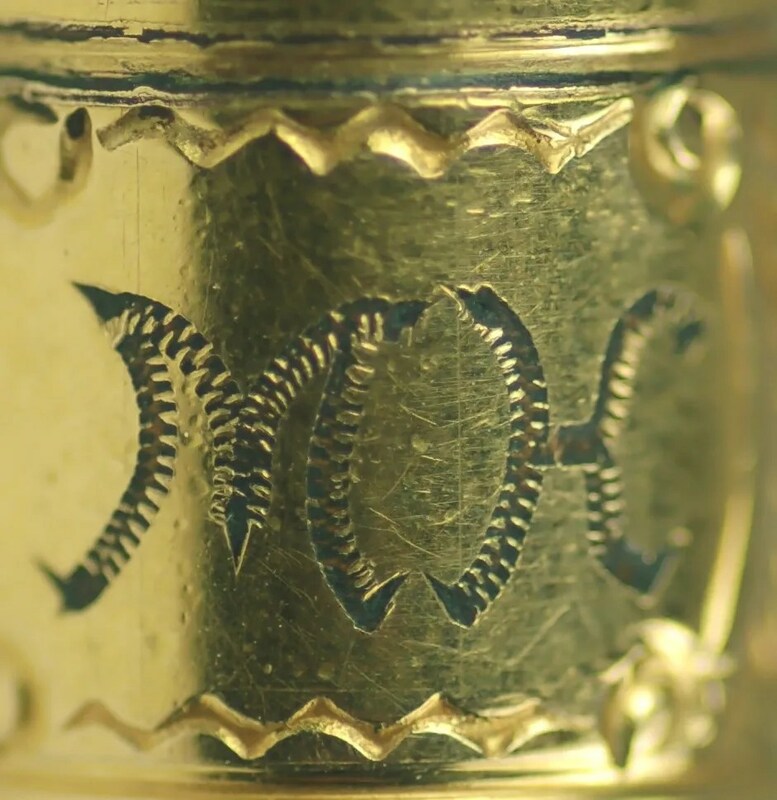 You can see that the gold decorative bands have held up very well over time. The double threaded section is quite unique and I have shown a couple of close-ups of it below. The pen measures a long 6 15/16 inches long (capped) and has a Warranted No. 4 nib. I feel very good about finally finding one of these. I hope that you all get the opportunity to find that one pen you have been spending time trying to locate. After several years I have finally found my “holy grail”. This sketchy history aside, I am an avid collector of these pens and am always on the lookout, especially for the Houston branded pens. I recently came across this Houston (Sioux City) pen. It is unique in two ways. First, most of the pens that I have from Houston / Snapfil / Jiffy have smaller No. 2 or 4 size nibs. This pen is quite a bit larger and has a very large No. 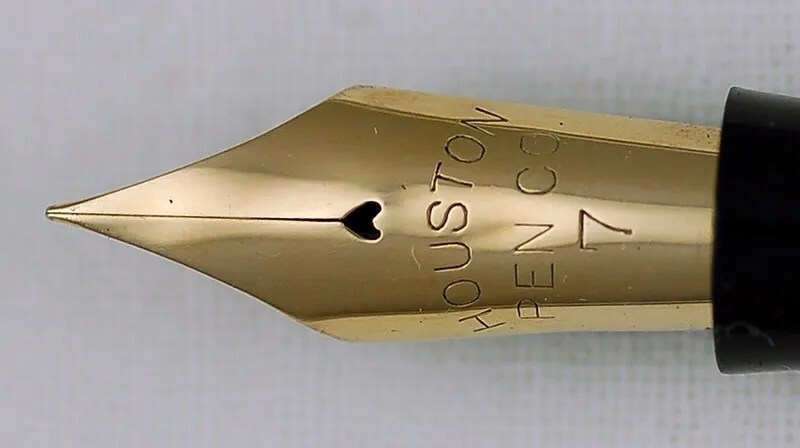 7 nib with the Houston imprint. Secondly, this pen came with complete box and instruction pamphlet. I have included a picture of the pen, instructions, and box lid below. 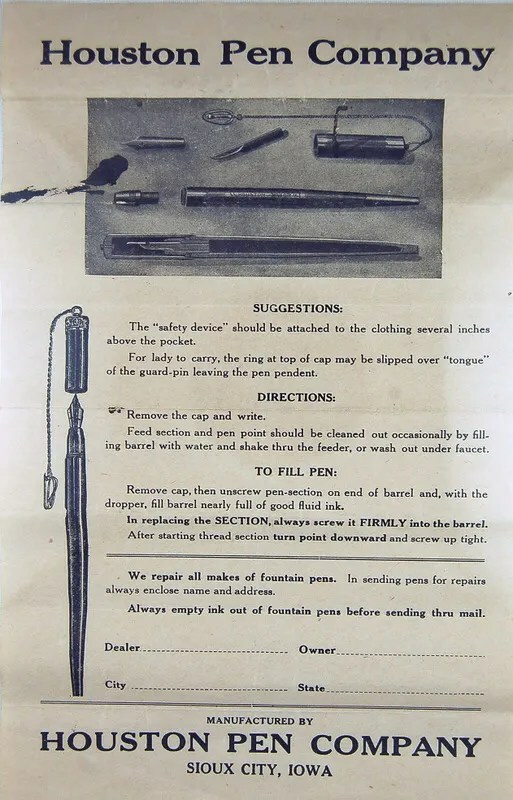 Many of these pens came with a chatelaine hook (or “safety device”) on the end of a chain which is explained in the brochure. This was a way to fasten the pen to one’s clothing for easy access. It is a very distinctive addition to many of the Houston and Snapfil pens. Here is a nice closeup of the large No. 7 nib after cleaning up the section, feed, and nib. As this is an eyedropper fill, there is little maintenance to be done, other than knocking out these and cleaning gently. The BCHR has not discolored very much and, as I mention in earlier posts, I do not like to re-blacken BCHR. Finally, a closeup of the Houston imprint and the finished pen. Closed, this pen is a large 6 1/4 inches long. Note the fairly clean gold decorative band. This pen has survived quite well. In future posts, I will discuss a Snapfil and Jiffy restoration. Houston pens produced in Tracy, Minnesota do exist, though I do not have one in my collection. I am always on the lookout for one of these early examples of Mr. Houston’s work prior to moving to Iowa.